These gorgeous little dumplings of potatoes are so delicious … pure heaven for potato lovers like me! It is great that we can still enjoy Gnocchi. And that is by simply replacing the normal flour with potato starch. Just a small note – do not confuse potato flour with potato starch as they are two different things. You need potato starch to make these Gnocchi. They are not difficult to make but they do take a bit of patience and practice and most of all persistence. They are meant to be delicate and light but a mistake can make them rubbery, dense and heavy. But do not give up! As they say, practice does make perfect! You can serve Gnocchi in so many different ways. They are delicious served in a cheesy and creamy sauce, but are equally great with a simple tomato sauce or a rich ragu. They can be baked, au gratin, or even simply sauteed in butter and oil, with fresh basil pesto and sprinkled with Parmesan. Like pasta, they can take any sauce! They are also lovely in soups! Cut the potatoes into 1-2cm pieces. Place in a large pan of cold water and bring to the boil. Boil for 10 minutes, until tender to the point of a knife, and then drain in a colander. (Some chefs stress that potatoes would be better roasted in the oven rather than boiled as this way they will absorb too much water. I had good results with boiling, but then again I will try roasting them too one time). Mash the potatoes preferably through a potato ricer into a large bowl. A potato masher will not mash the potatoes fine enough and the result might still be lumpy. Add the butter and the egg yolk. Season generously with salt, pepper and a dash of nutmeg and mix well to combine. Stir in about two-thirds of the potato starch into the bowl of the mashed potatoes. Using your hand, combine this with the potatoes until the mixture comes together, gradually adding more starch until you have a soft and silky dough. Tip the dough out onto the work surface and gently knead the dough. The dough should not be wet, if it still is, add a little more starch. Take small pieces of the dough at a time, keeping the rest covered, and roll out gently into a snake about 1.5cm thick. Cut into pieces about 2.5 cm long and using a gnocchi board or a gnocchi spoon (like the one in the picture above) by Genietti, roll and indent the gnocchi pieces and lay out on a tray. You can also leave them in a round shape or roll them against the tines of a fork. Continue until the dough has been used up. Cover with clingfilm and refrigerate while you prepare your sauce. When you are ready to cook the gnocchi, put a large pot of salted water on the stove and when it comes to rolling boil, throw the gnocchi in. Best if you cook these in three batches. The gnocchi will sink to the bottom of the pot when you throw them in, but they will gradually float to the surface. That is when they are ready. 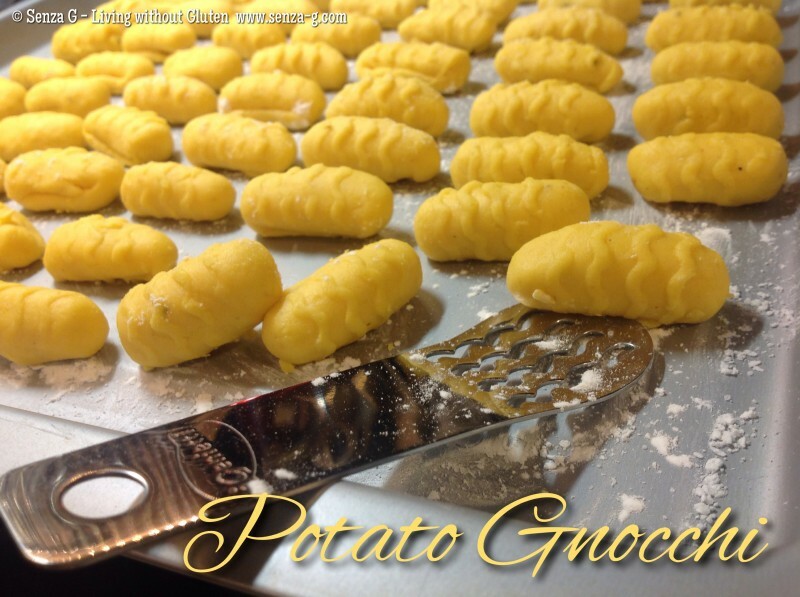 Scoop them out, using a slotted spoon and keep warm until all the gnocchi are cooked. Proceed to serve the gnocchi with your preferred sauce. Why not try this – Potato Gnocchi with a Creamy Dolcelatte & Walnut Sauce?